The promise of spring and beautiful weather is captured in a bottle of St-Germain. The elderflower liqueur is sweet and floral with a bit of citrus peel and is unique amongst liqueurs in flavor and scent. Its a favorite of Mrs. Ferment, who voraciously hoards her bottle from eager seekers of St-Germain cocktails. It was out for a while before Mrs. Ferment and I came across it at the annual Michael Arenella and His Dreamland Orchestra Jazz Age Lawn Party two years ago. St-Germain sponsors the event and, therefore, is a major ingredient in the cocktails found at the soiree on Governors Island. There were two types of cocktails, the elegant St-Germain cocktail and the fruit-filled Sangria flora. Fill a Collins glass with ice. Pour over ice sparkling wine, St-Germain, seltzer, in that order, and stir. Twist lemon peel over glass, drop it in, and enjoy. The fruit, while necessary, need not be these particular choices, so feel free to experiment. Put all ingredients into a carafe and refrigerate for 15–30 minutes. Pour over ice-filled Collins glass. After the event, having enjoyed the cocktails immensely, both of us and our companions, Mr. F～ and Ms. P～, were eager to pick up a bottle as quickly as possible. We found a liquor store nearby that sold St-Germain for $50. This, to Mrs. Ferment and me, is the singular problem with St-Germain—its price—hence Mrs. Ferment’s previously noted hoarding. But we’ve found the liqueur worth it. It has a pleasant viscosity that matches its light golden color, like a honey syrup. There’s honey in its taste profile, too, along with floral honeysuckle and a hint of grapefruit. St-Germain is meant to be an ingredient, though. It’s a touch too sweet to have it as a singular apéritif. But lemon rind and a spritz of bubbly seltzer complement the liqueur so well that they’re both included in many of its cocktail recipes. Mrs. Ferment and I had to concede that there was nothing like the real thing. 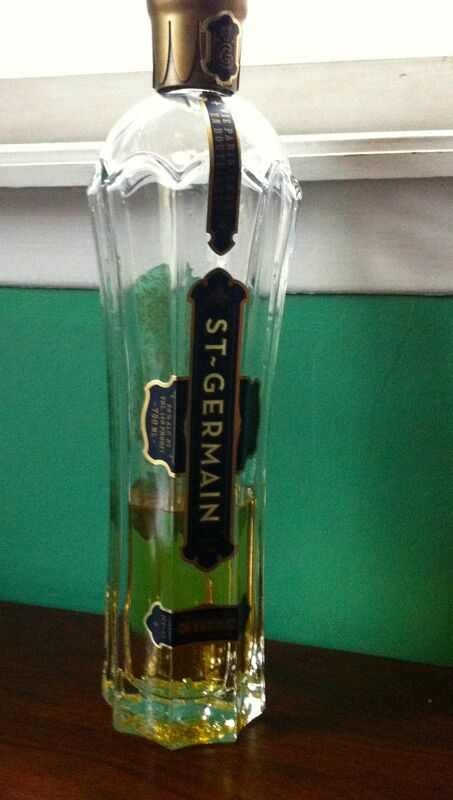 We’ve since found St-Germain as cheap as $40 for a 750ml bottle. It’s liquid gold, so we try to stock up on it as we can. The dear sister of Mrs. Ferment gifted her a bottle for her birthday, slightly relieving our self-imposed embargo on making cocktails with it. There’s a wonderful story behind the origin of St-Germain, and the French artisans who pick fresh elderflowers in early spring and hand-press them to release the flowers’ essence. And the marketing for it makes it seem like a drink popular during Prohibition. It’s all a bit hard for me to swallow, having a bit of knowledge about how anything mass-marketed is made and advertised, but, thankfully, St-Germain itself is not at all difficult to swallow, so I’m happily caught in its fantastic, romantic allure. Just recently discovered this & do recommend –for the frugal by necessity– St. Elder. It’s $20 and warrants another taste test gathering among your friends, even those with less discriminating palates. It’s wonderful! I may dedicate my summer to experimenting with it. Salut! Thank you or coming to the website Carrie! I will search for it. I see a St. Elder/St Germain tasting in our future.